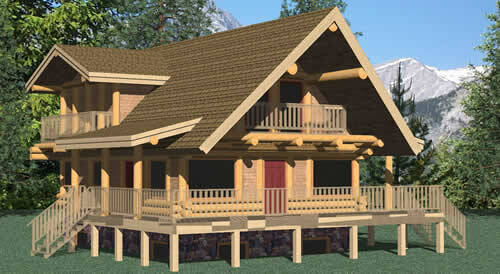 We are very excited about introducing our new line of log home called the Crafts-Man series. 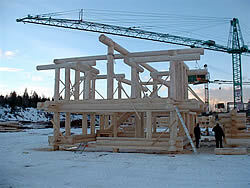 It is simply the best mix of logs with conventional framing and siding between the massive posts. 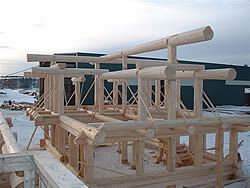 We are using two courses of the Scandinavian full-scribe 12” -14” mean diameter full round logs for the sill around the full perimeter of the dimension of the house and two courses of the Scandinavian full-scribe for the header logs with massive log posts throughout. 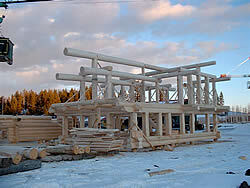 This style of log home is on the line of the Post and Beam, Timber Frame construction. 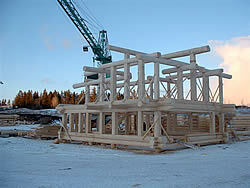 This allows us to build and set the complete log shell, it can stand on its own. Between the massive posts allows you to use a variation of siding materials such as cultured stone, slate, board & bat, shingles and the list goes on. This style of log home seems to blend so well with other cabins and homes that they are being built at the lake or on the ski hill. They also blend well in the conventional stick-built neighborhood.